Unlike the occasional nervous feelings that everyone experiences, anxiety is described as a constant psychological state that is characterized by intense feelings of worry, tension, and nervousness. Anxiety episodes are often irrational, and occur even when there is no apparent threat to provoke these feelings. Anxiety affects women two times more than men, which is due to the hormone fluctuations experienced during menstruation, pregnancy, and menopause. There are several treatments for overcoming anxiety episodes, including diet and exercise. 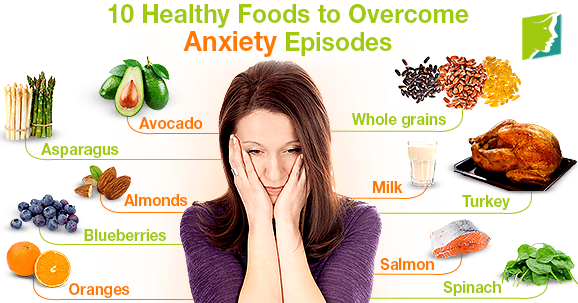 This article focuses on the best healthy foods that can help overcome anxiety episodes. Pasta and bread made from whole grains rather than refined grains are rich in magnesium and tryptophan, and help create energy and reduce hunger. This is because while grains are rich in dietary fiber, which regulates the movement of food in the digestive tract and promotes a feeling of fullness. This vegetable is rich in folic acid (vitamin B9), which has been known to help enhance mood, thereby helping to prevent anxiety episodes. Avocados are rich in B vitamins, which help relieve stress and promote healthy nerves and brain cells. They are also a good source of monounsaturated fat and potassium, which helps lower blood pressure. These nutrient-dense fruits are packed with antioxidants and vitamin C, which helps reduce stress and repair and protect cells. A warm glass of milk before bed is a tried and true remedy for insomnia and restlessness. Milk is high in antioxidants, vitamins B2 and B12, protein, potassium, and calcium. Almonds have been found to improve mental and heart health. These nuts are rich in vitamins B2 and E, and are thought to support the immune system during times of stress. These citrus fruits are rich in many nutrients, especially vitamin C. Many people also find the citrus scent to be calming. Salmon is rich in omega-3 fatty acids, which help prevent cortisol and adrenaline levels from spiking. This leafy green is packed with magnesium and other beneficial nutrients that help regulate cortisol levels and promote feelings of well-being. Tryptophan - which is an amino acid found in turkey - signals to the brain to release the feel-good neurotransmitter, serotonin, which promotes calmness and tranquility. Anxiety affects around 40 million Americans on average, occurring two times more in women than in men. Hormone fluctuations are the primary cause of anxiety in women, but stress and poor diet have also been known to trigger anxiety episodes. Eating healthy foods like spinach, almonds, oranges, blueberries, and turkey can help prevent anxiety episodes. Exercising, keeping a strong support system, and taking time to relax can also be beneficial for treating anxiety. It is important to try out different treatment options to see which works best for you.